There are many types of pipe cutters. They are designed for small or large pipe and for different types of pipe such as Steel, Copper, Plastic or Soil. 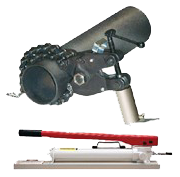 There are units designed to cut multiple pipes at the same time with a special chain design, electric band saw styles for quick cuts of larger pipe and small hand held units. • For 1/4" to 2-3/8" (6-59mm) O.D. • Only requires clearance of 2" to 3"
• Hubless Cast Iron Pipe: 1-1/2" through 6" Nominal Dia. • Vitreous Clay Pipe: 4" Nominal Dia.